Filipino ring idol Manny Pacquiao’s rematch with Mexican legend Marco Antonio Barrera did almost 350,000 pay-per-view buys which was equal to the number of buys in each of the fights in the epic trilogy with another legendary Mexican Erik “El Terrible” Morales. Top Rank promoter Bob Arum, who was co-promoter of the Mandalay Bay Resort Hotel and Casino fight card with Oscar De La Hoya’s Golden Boy Promotions, told John Whisler of the San Antonio Express News that the Barrera fight did a live gate of $3 million and registered about 350,000 pay-per-view buys including 3,800 in San Antonio. Arum at the same time said he is considering bringing Pacquiao back to San Antonio, Texas for a fight possibly in March in the first of three fights Pacquiao said he wants in 2008. 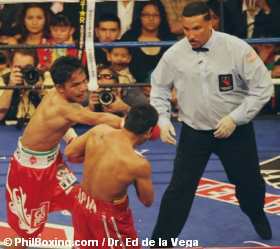 Pacquiao’s first appearance was at the Alamadome in San Antonio when he demolished Barrera in eleven brutal rounds while in his second appearance he knocked out previously undefeated but unknown Jorge Solis in eight rounds. A fight in San Antonio would make sense if the opponent is undefeated WBA/IBF and WBO lightweight champion Juan “Baby Bull” Diaz who is a native of Houston, Texas. Pacquiao himself has clearly stated he would fight anybody if the price is right but the first Diaz on the list was southpaw David Diaz, the WBC champion who beat Morales in his last fight in what many considered a close decision. While David Diaz throws a lot of punches the feeling in the Pacquiao camp is that he doesn’t pack too much power unlike Juan Diaz who hits hard and is an aggressive fighter.